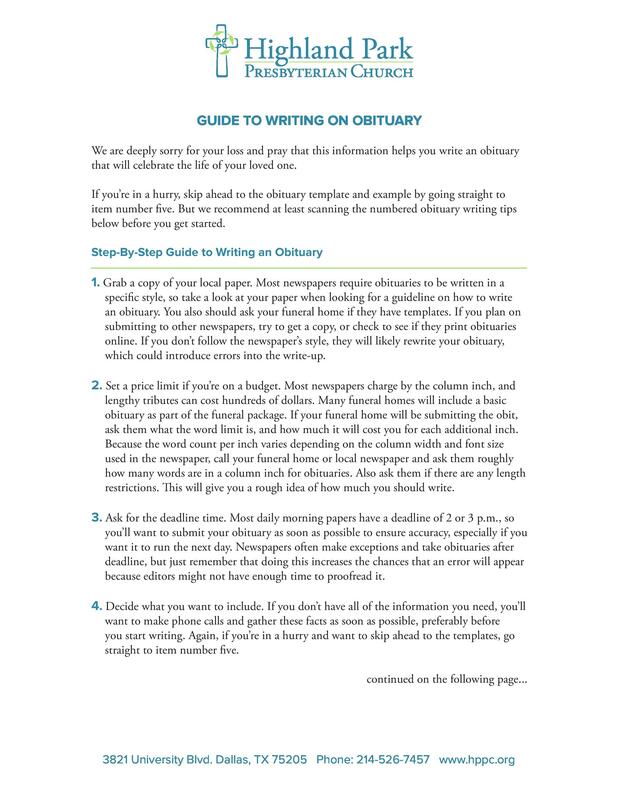 An obituary is essentially a notice of death, mostly a newspaper article that has a brief description of the biography of a deceased person. 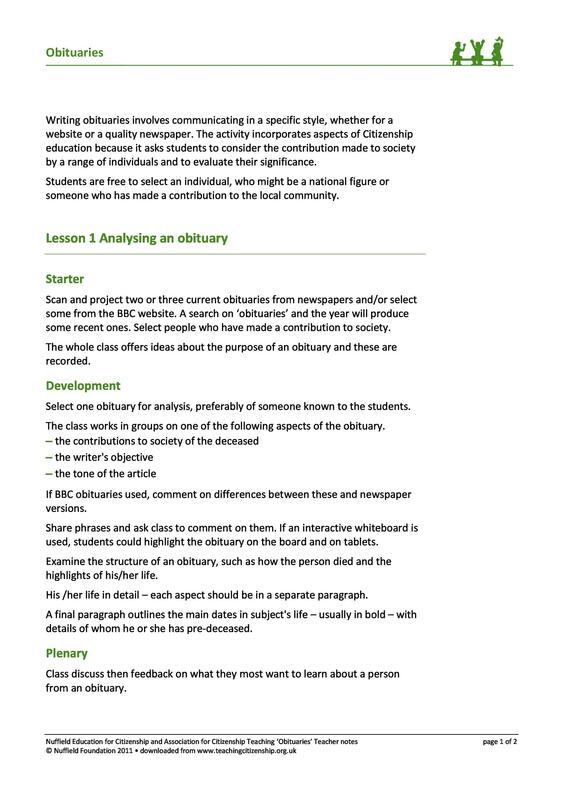 While drafting an obituary for a loved who has just passed on it is important to put great care and thought on how the information is conveyed. It has to be as precise as possible in expressing the great loss, the pain that the close associates of the deceased have to endure as well as a celebration of a life well lived. 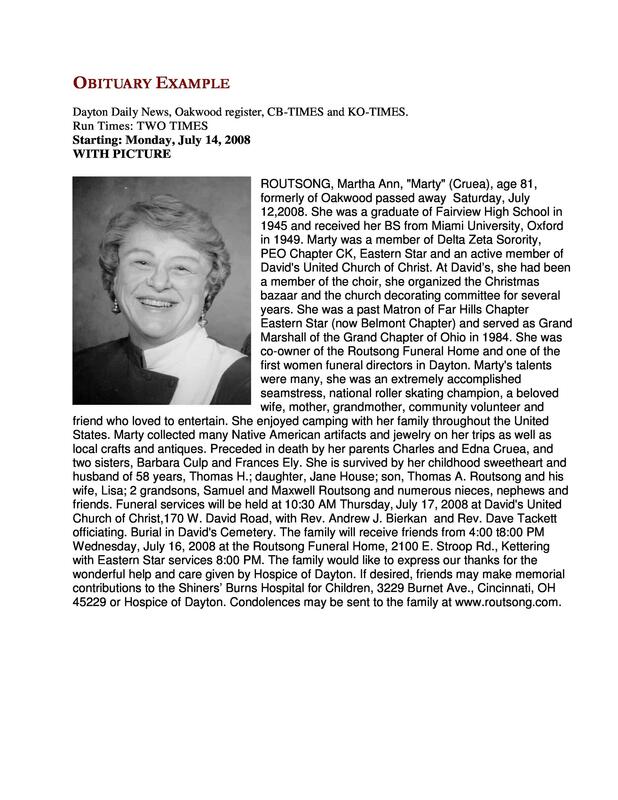 Many people get stuck up while trying to draft obituaries but writing an obituary can be easy and less perplexing our help. Be less worried about forgetting the most important details to include as this will be mentioned in the course of this article. 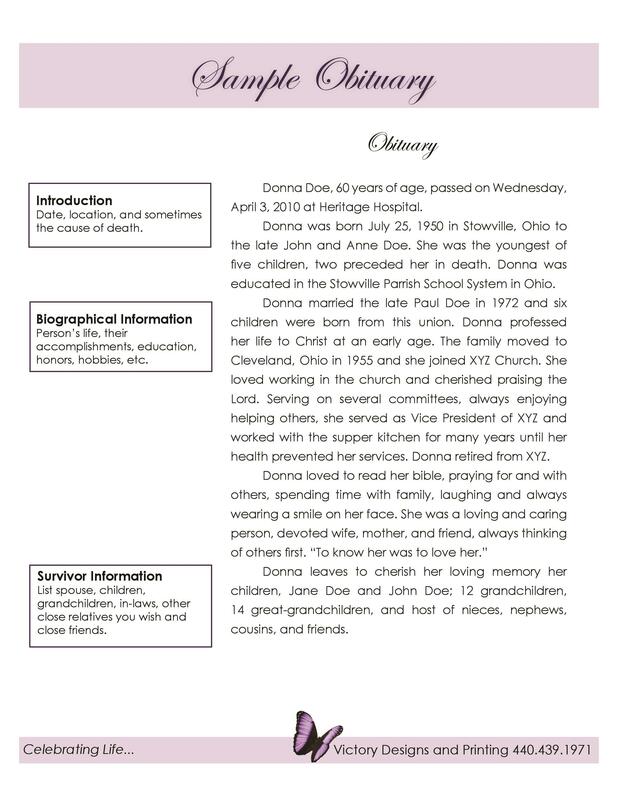 You can also have look at some of our obituary samples or obituary examples. 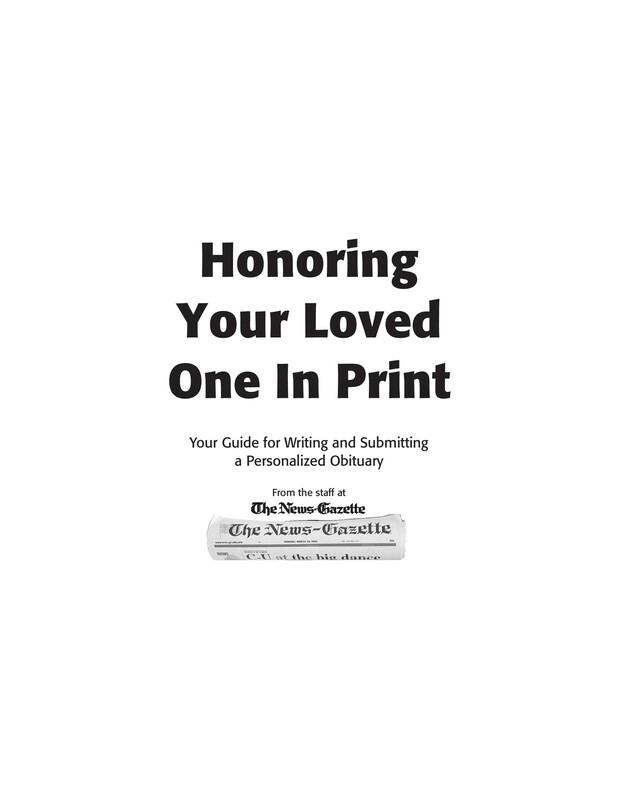 An obituary template provides an easy way to create newspaper obituaries or obituary programs. 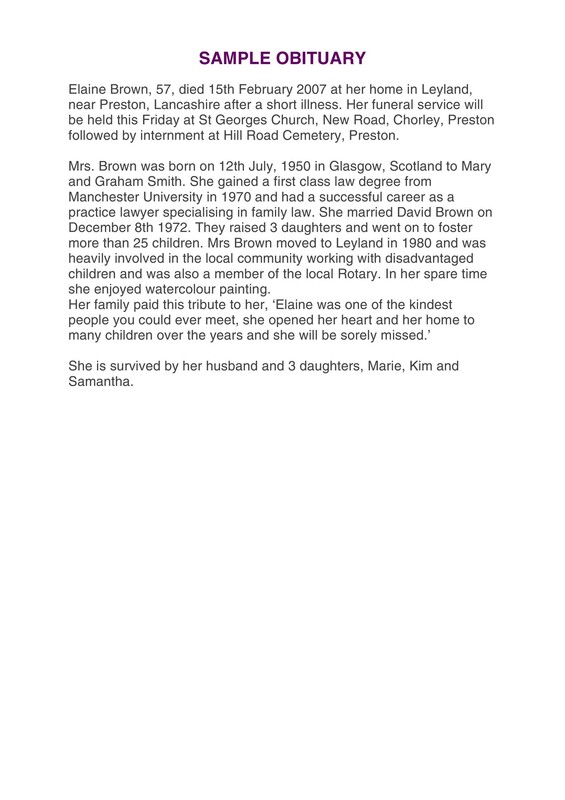 Obituary gives an account of the deceased person’s life, informs the public about the death as well as outlining the information about the planned funeral together with the memorial service. 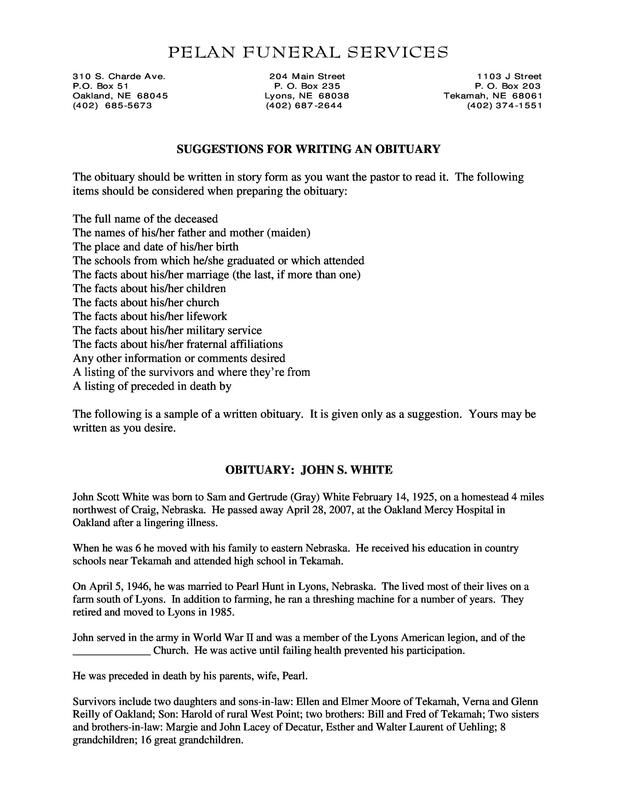 This site will provide a free obituary template to give you an easy time while drafting an obituary to be published in your local newspapers. The first part is the dateline. This refers to the city or county of residence of the deceased. 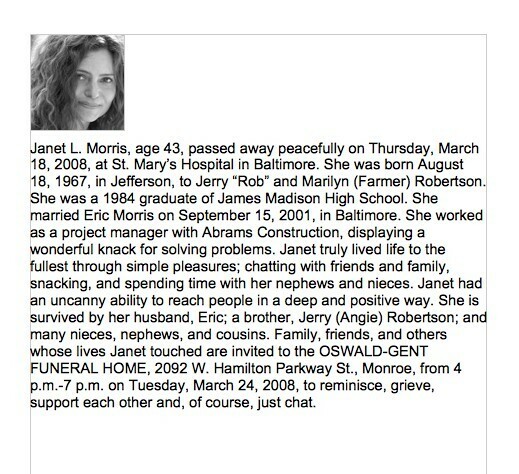 It acts as a heading at the top of the page of the obituary. Details of the deceased then follow. 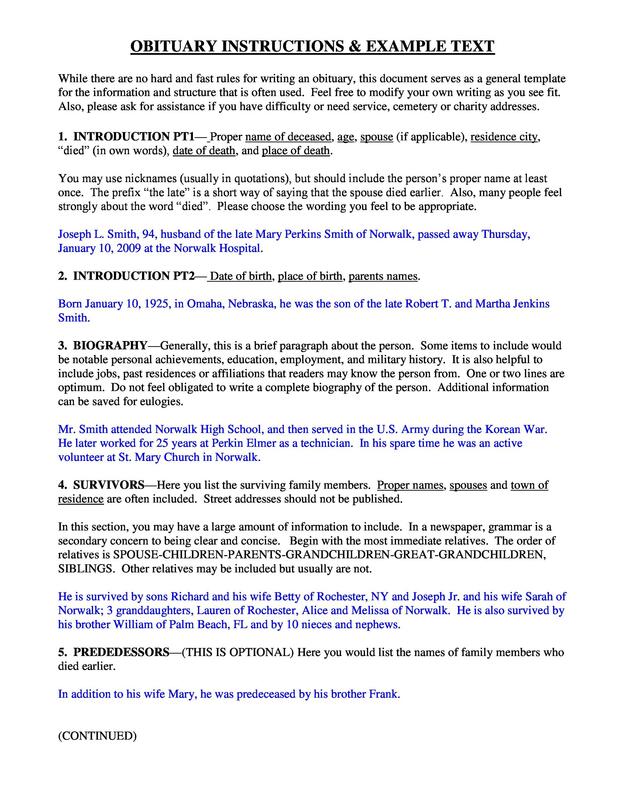 Include the name, age, residence and place of birth. The next section defines what the deceased did while on earth. Their occupation, any memberships, military service or any other relevant thing should be included. You could also personalize the obituary by including the hobbies or activities that a lost one used to be involved in with enthusiasm. The names of the parents and those of the family members of the deceased come next. It is in this section that the name of the surviving spouse is listed too. You could elongate this section by including notable times in the marriage life of the deceased or talk about memorable moments in his childhood. The preceding part will outline the survivors. Include the names of the surviving children. For the case of a young child mention the names of the paternal and maternal grandparents and great grandparents as may apply. Finally the service arrangement can be highlighted at the end. Make sure that you address questions pertaining to who, what, when, where and when concerning the services. 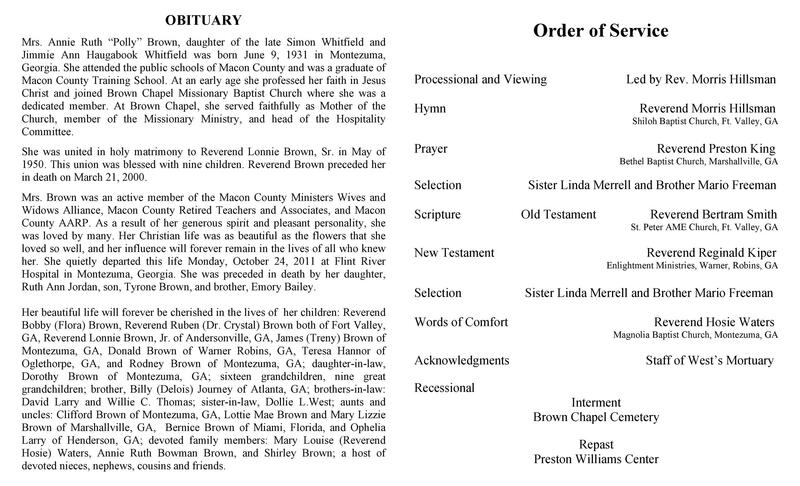 The obituary may not only be used for the announcement on local newspaper, you can also include it in the funeral program that will be handed to the friends and relatives in attendance. In this case it will serve as keepsake as memory of a lost loved to the general community. 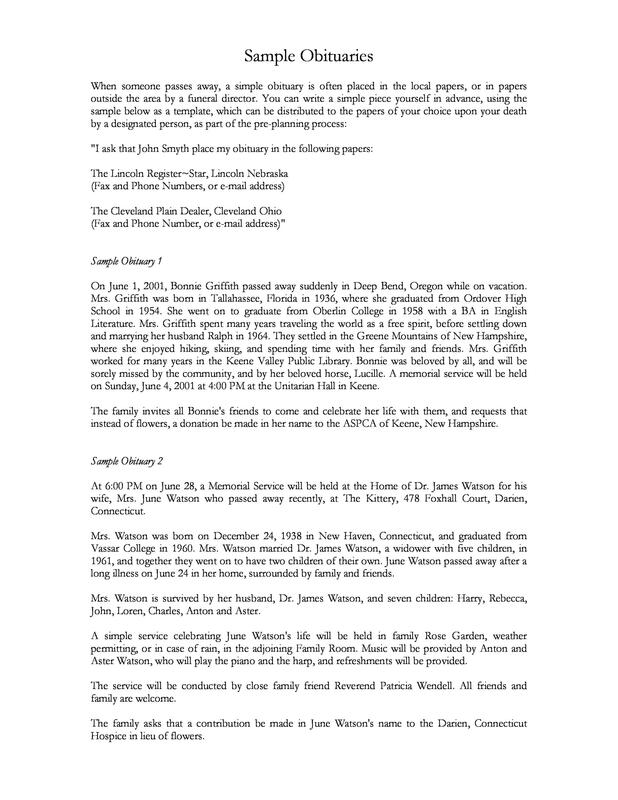 Check out our sample obituaries to get a solid idea of what is being relayed. 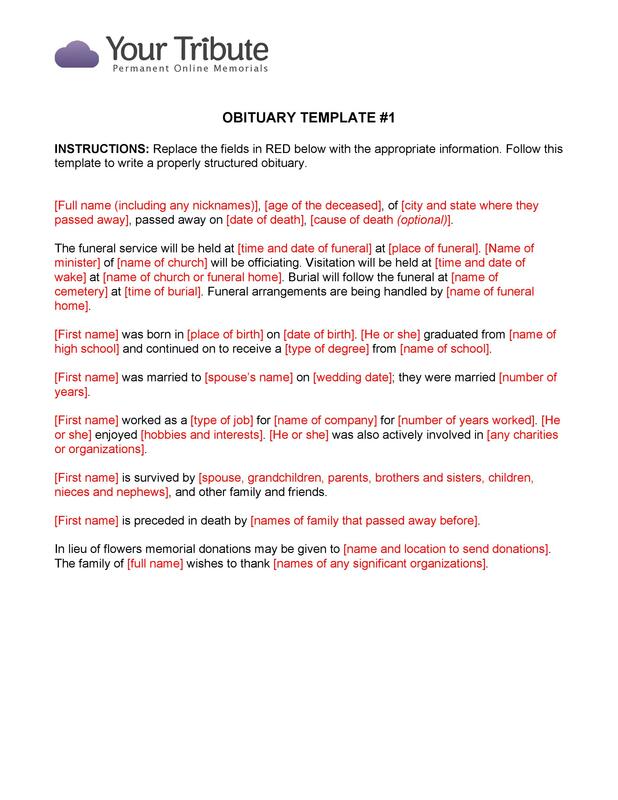 The primary function of an obituary is to clearly bring out certain bits of information that the general community, friends and relatives of the lost one need to know about the deceased and the funeral arrangements that have been put in place. It is recommended that one starts with the name, age as well as the place of residence of the deceased person. This should then be followed by the time and place that their death occurred. You could use a wide range of phrases to denote the death of an individual but stick to what you are comfortable with. At times the cause of death may be omitted but it will prudent to include it if it is not subjective in nature to avoid too many question being raised by members of the community. It is good to be precise by outlining only the most important events, qualities and contributions of a deceased person. Try to bring out the uniqueness of an individual while at this. 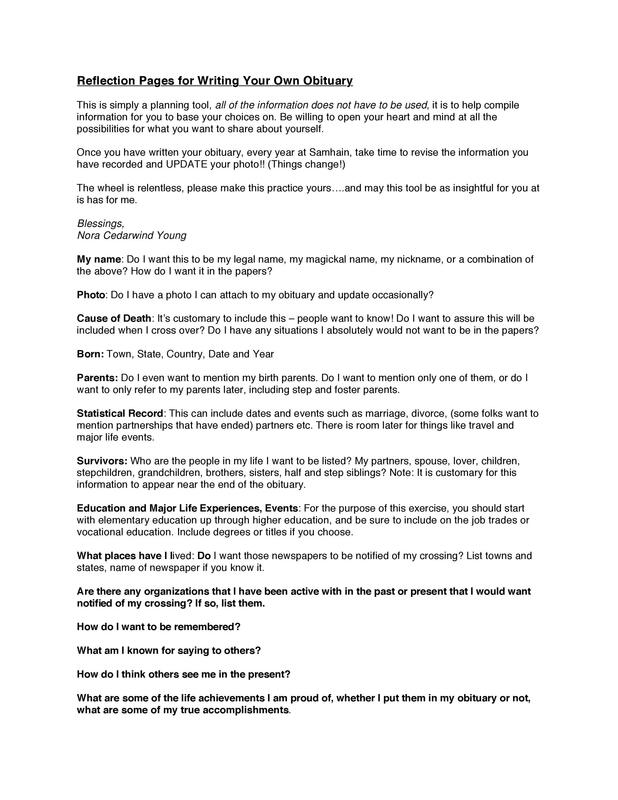 It is paramount for you to include the date and the place of birth, the names of parents of the deceased and remember to include the mother’s maiden name, the date as well as the place of marriage, their education and their work before passing on. Don’t forget to include military service as may apply. 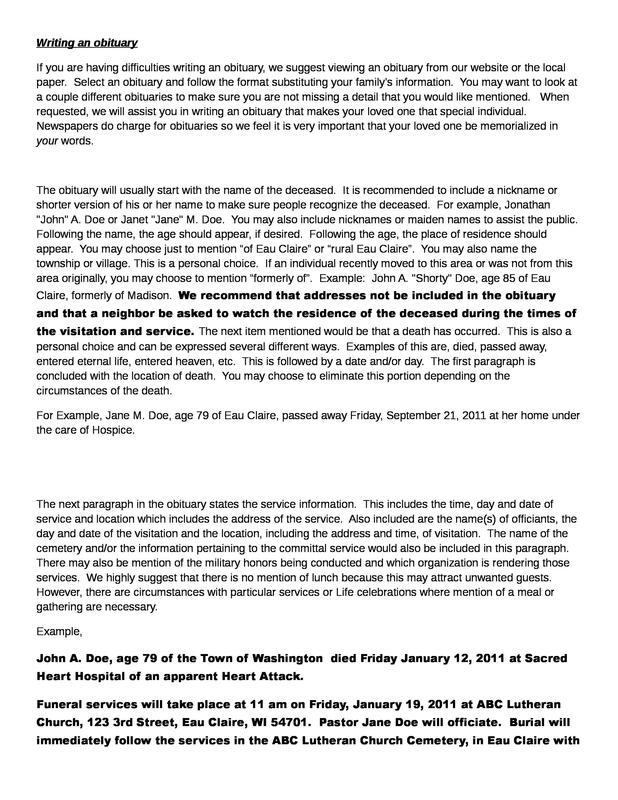 This document is not a legal document so you could add what best fits your judgment, for instance some striking experience you had or heard about the deceased. The life events should be listed in a chronological order. Mention the notable achievements and try to paint a memorable picture of the deceased to liven up the obituary. Don’t forget to state how he/she inspired the community, in this case you can include a famous statement or quote he preferred to speak out his/her mind to the community and those around him. Most people like to refer to the funeral as one for the living and this should also apply to the obituary. 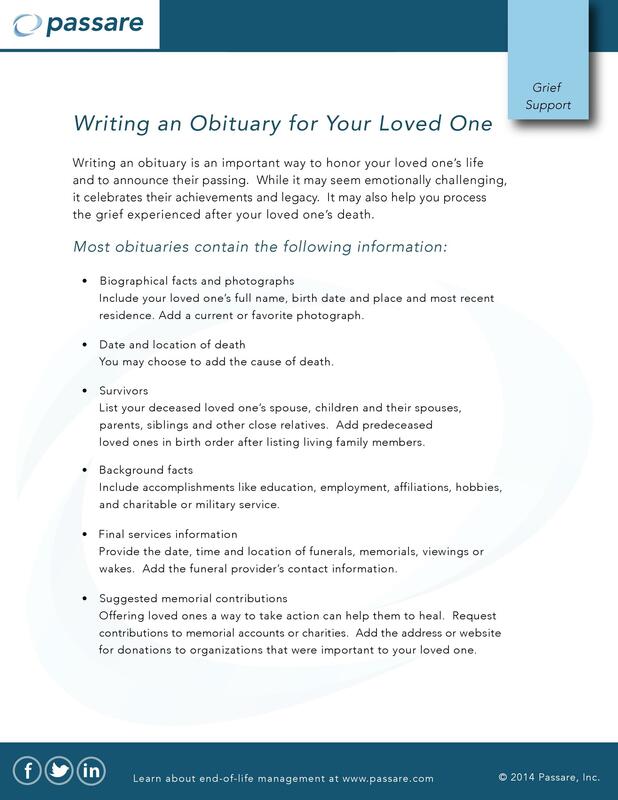 By listing the deceased surviving relatives you bring some life to the sad moment. Though it is a moment of grief it is would not be wise to forget to mention key relatives. Don’t leave out a step-child. Start with the closest survivors of the deceased that is their spouse, children, grandchildren and great grandchildren, their parents as well as their siblings. Their cousins, nieces and nephews are left out unless they were very close to the deceased. For the grandchildren and great grandchildren it would be prudent to give a number to avoid leaving out one of them. This section should be in line with the normal routine for a given location depending on their traditions. It would be best to consult the local newspapers or leave this part to be decided by the funeral director. The key bits include the time, the full date as well as the place where the service will be held, remember to include the person to officiate the occasion. 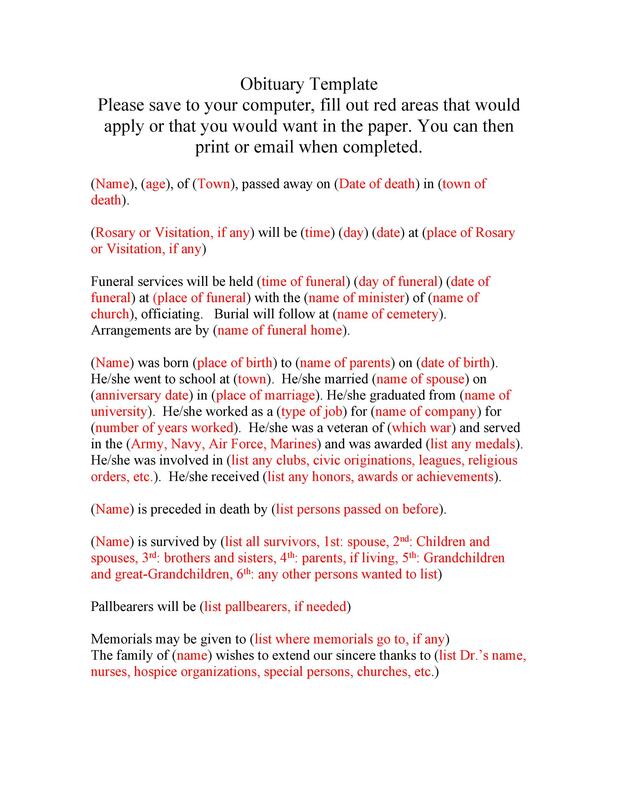 You could also include the time, the full date and the location for the burial or interment as may apply. 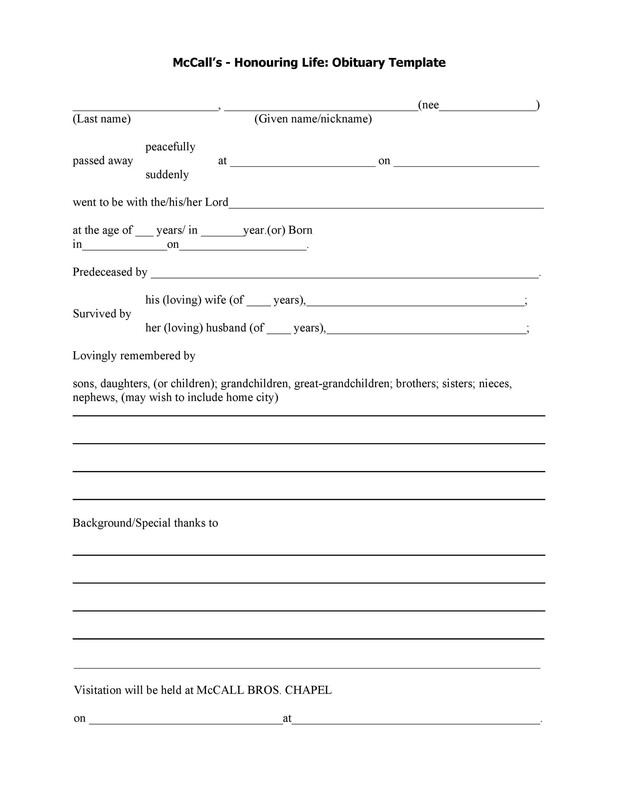 Don’t forget to include the time, full date and the place of visitation. This or a short inspiring Bible verse or a poem’s line may apply. This may be omitted but they act as a way of summing up the obituary or ending it on a poetic note. The use of a photo forms the best reminder that people can have of the deceased. Though this might turn out to be expensive it is a good for identifying a deceased. They also portray a mental picture of the person that the community will miss and it also differentiate an obituary from the other obituaries. While at this make use of the recent photos and that will make it a lot easier for people to picture the deceased just before the tragic incident that led to their death. 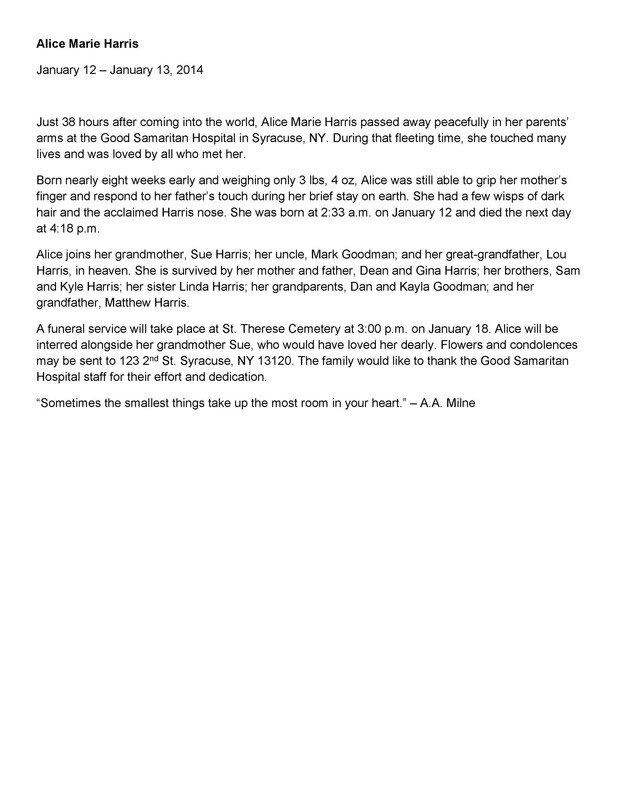 Generally an obituary should be informative, easy to read and expressive in nature. 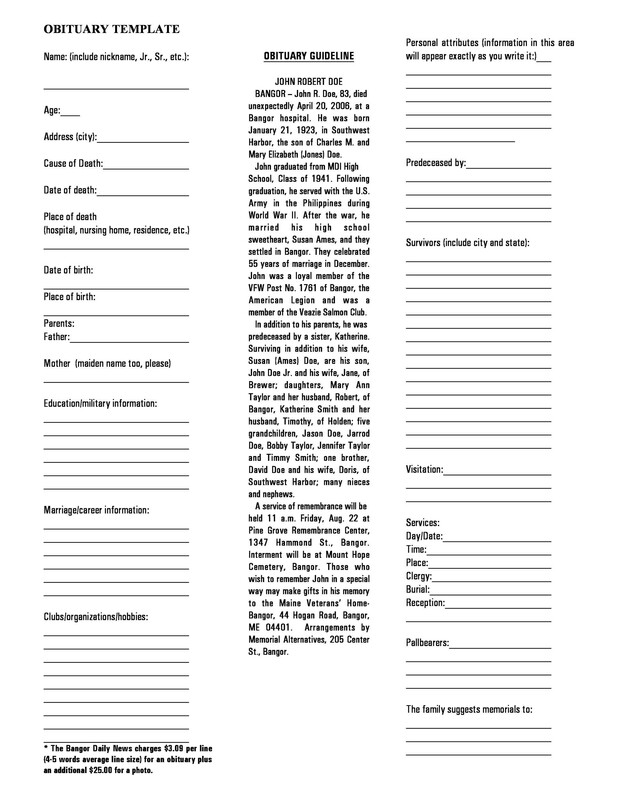 A funeral/obituary program is a must have in a funeral or a memorial service of a lost one. 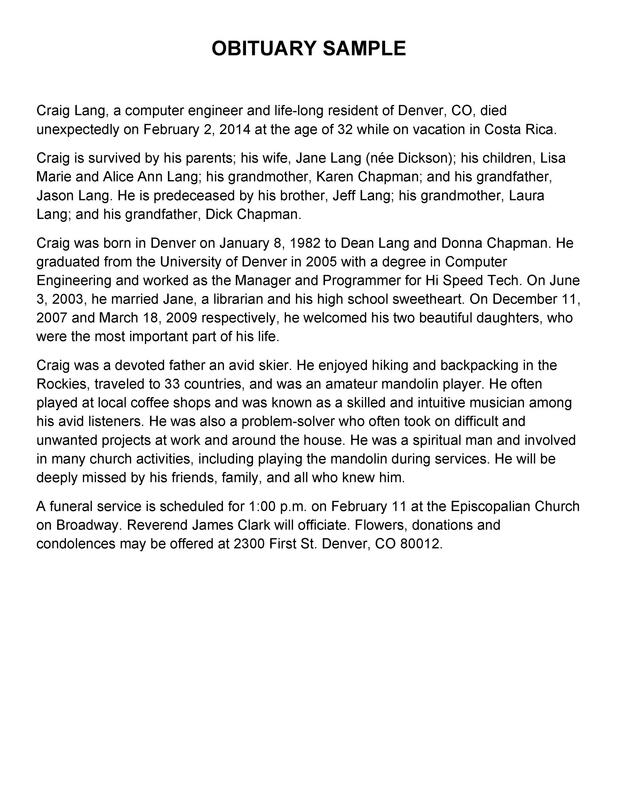 These obituary programs are normally printed out and distributed to the friends and relatives in attendance. 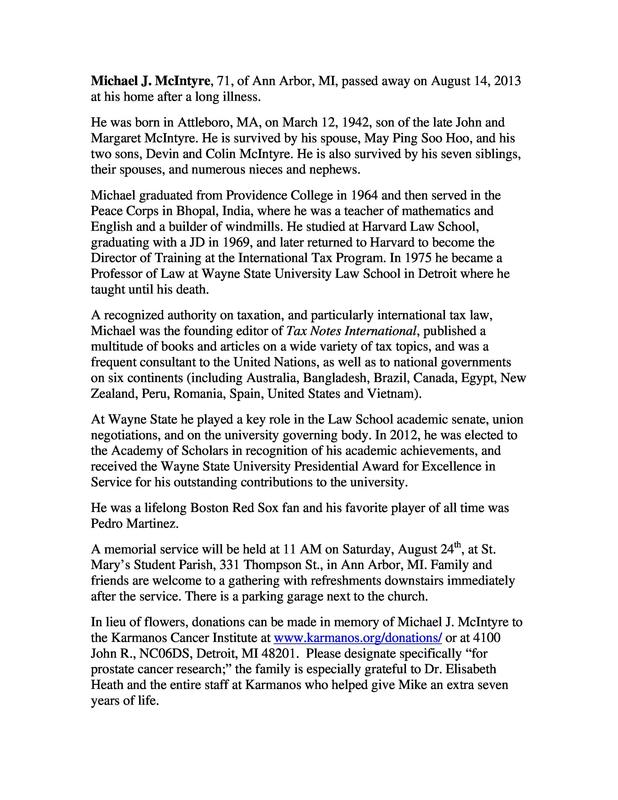 A lot of information is included in an obituary and this distinguishes it from other programs. For this reason it is not surprising to have one that has several pages. Personal details such as the birth place, residence and the schools attended. This is characteristic of most obituary programs. 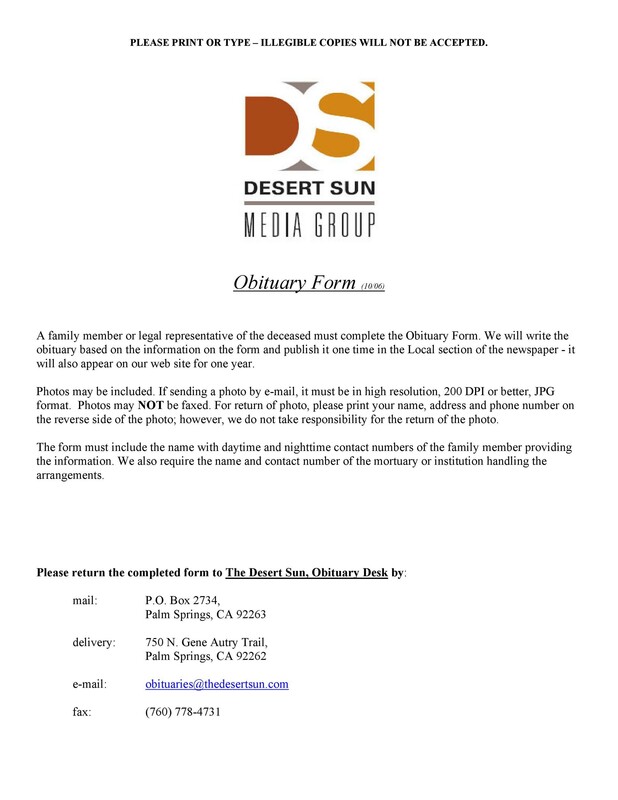 Get the electronic version of the photos for easier manipulation and insertion into the obituary program. You could make use of friends and family members to get the most appropriate photos. The social media platforms could also be a good source for this. Some info on the repast as well as the reception. 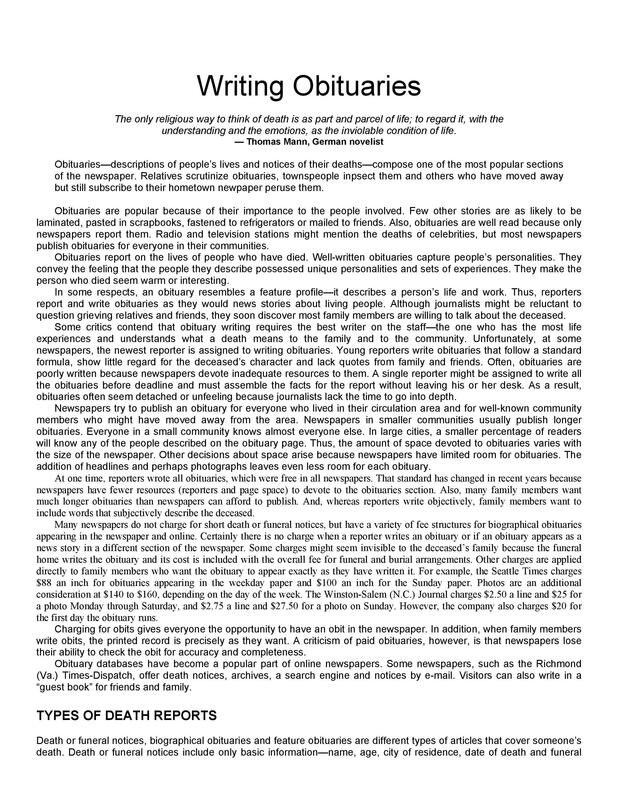 Obituary program templates by far are the easiest and most convenient way of coming up with obituary programs. 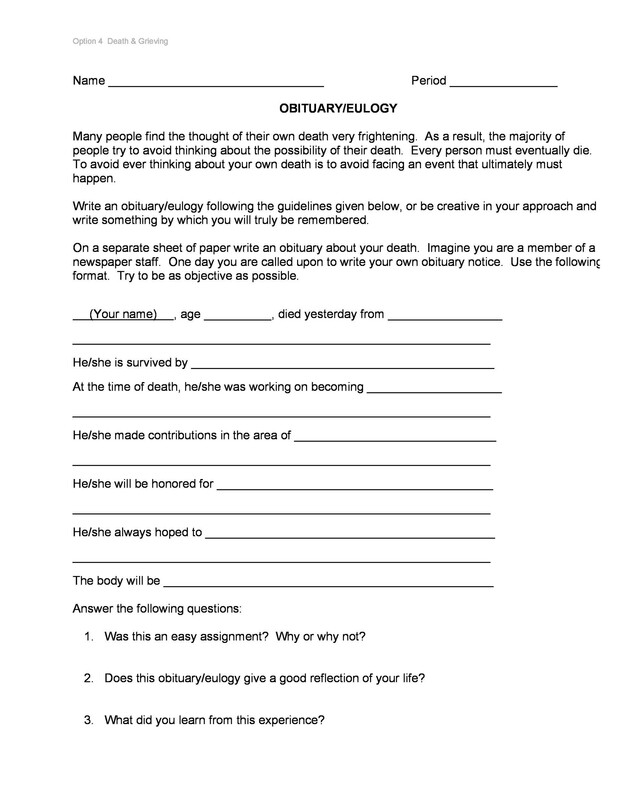 This site provides you with free obituary program templates that you could make use of to make it a lot easier for you in your moment of grief. 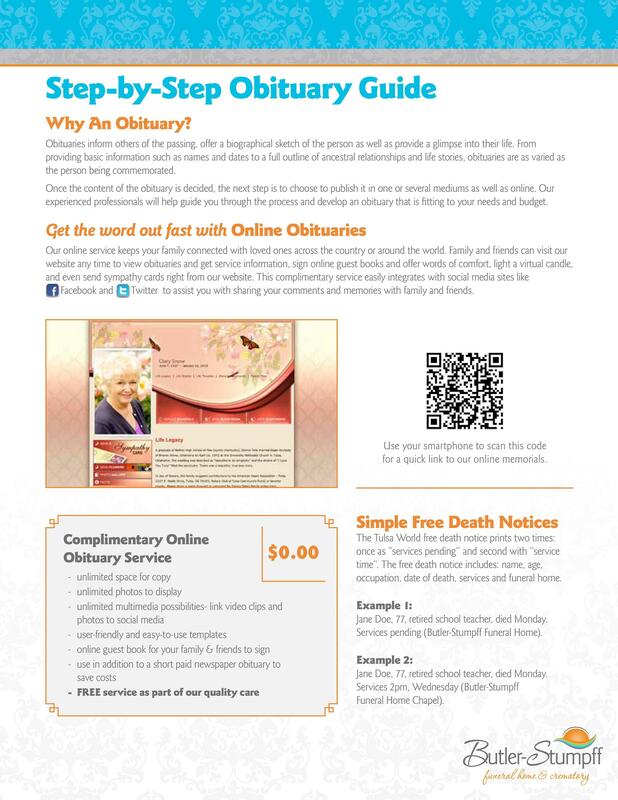 The obituary program templates are in different designs and they are also suited for different software types. You may find them in different layouts and sizes. The use of a renowned and trusted site like ours will make sure that you don’t go wrong on anything. 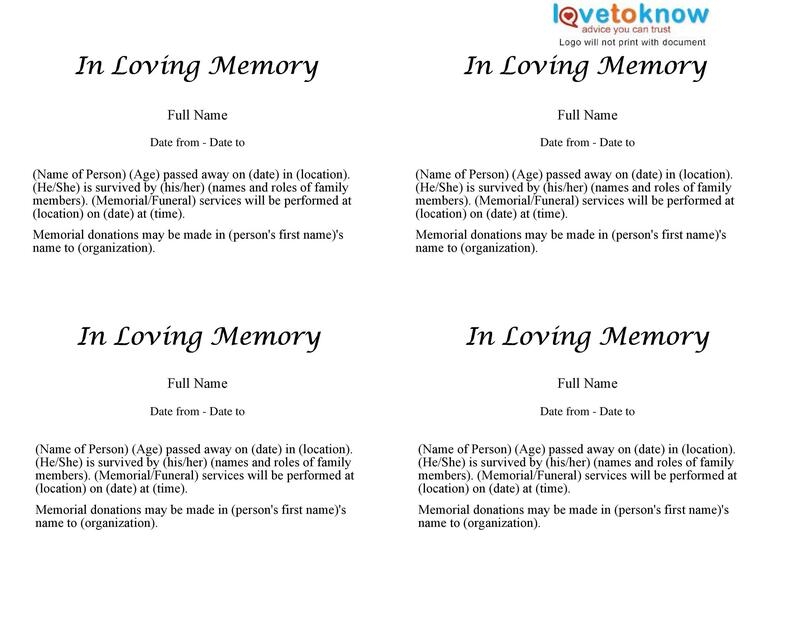 Lastly when choosing an obituary template make sure that you have the necessary software for particular design.